From 7 MAR 19 from 0700 UTC to 29 APR 19 till 0530 UTC, RWY 12/30 will be closed for take-offs and landings. Taxiing of aircraft in section between RWY 06/24 and TWY R from SR to SS according to instructions issued by TWR. ILS RWY 30 / DME PG (FREQ 109,50 MHz) out of order. ILS RWY 12 / DME PA (FREQ 109,95 MHz) out of order. Day and night marking according to EASA CS-ADR-DSN. 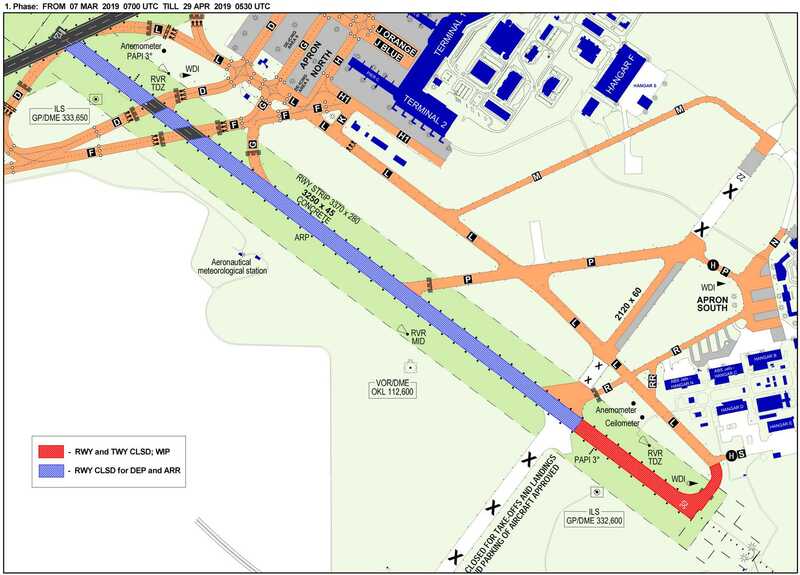 From 29 APR 19 from 0530 UTC to 9 MAY 19 till 1300 UTC, RWY 12/30 will be closed for take-offs and landings.